STOUGHTON, Mass. – The last time Milford senior Alex Macek toed the rubber on Anthony Noviello Field on the campus of Stoughton High School, things didn’t exactly go as planned as the Black Knights exploded for 15 runs. This time around, things couldn’t have gone much better. Macek pitched 8.2 innings, allowing just two innings in the first inning, and struck out seven, leading the Scarlet Hawks to a 3-2 win over Stoughton in nine innings. With the game tied 2-2 in the top of the ninth, Macek hit a grounder to the left side of the infield and the throw to first was short, allowing sophomore Alex Coady to cross for the go-ahead run. 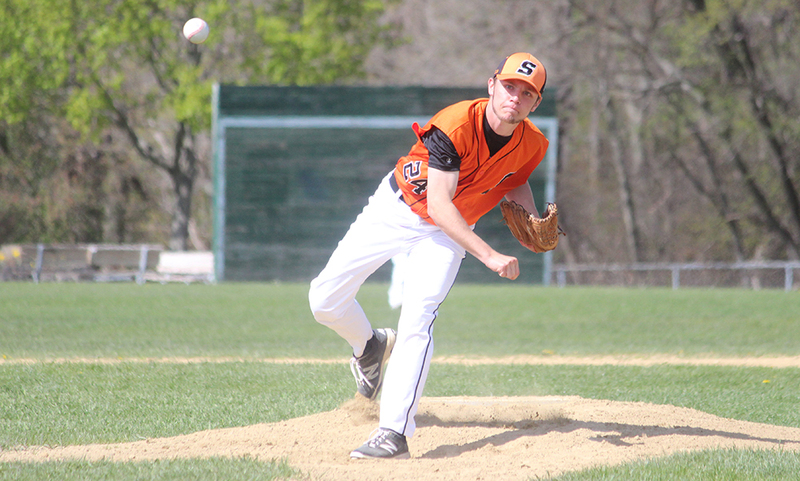 Stoughton’s Ryan Sullivan drew a two-out walk and Jack Connelly singled to put runners on the corners with two outs. Milford’s Aidan Wilde relieved Macek on the mound and got the final out, a grounder to third. Stoughton had a bright start as Ruben Gonzalez reached on an error to lead off and Sullivan sliced a an RBI triple down the right field line after a lengthy at-bat. Connelly took first after being hit but Macek induced a double play, allowing just the one run to score and recorded the third out to escape with just a 2-0 deficit. Macek then tossed seven and two thirds scoreless, working around a one-out double in the second, a bases loaded situation one one out in the third inning, runners first and second with no outs in the fifth inning, runners on second and third with one out in the sixth and a lead off single in the seventh. “I had pitched well against them last year before the 15-0 game earlier this year, so I was confident and I knew it wouldn’t happen again, I wouldn’t let it happen,” Macek said. “The first pitch curve was working well for me and I was getting inside and jamming them. Milford cut into the lead in the third inning, loading the bases for the first of three times in the contest. Tony Mobilia was hit by a pitch and Ryan Goncalves followed with a one-out single. Anthony Arcudi laced a single to load the bases and Wilde drew a walk to cut the deficit in half. Stoughton starter Justin Hutchinson (6IP, 1R, 6H, 7K) bounced back and recorded two straight strikeouts to avoid any further damage. Milford would send three more batters up to the plate with the bases loaded. The Hawks filled the bags with one out in the fourth but Connelly made a nice grab over the dugout fence in foul territory and Hutchinson got another strikeout. Milford loaded them once again with two outs in the sixth, but Stoughton’s Pat Hagerty made a charging catch in center for the third out. It looked as though the Black Knights pushed across their third run of the game when sophomore Evan Gibb dove head first into first and appeared to beat the throw, allowing Sullivan to score, but the infield ump called the play out at first. Wilde started the Hawks off on the right foot in the seventh inning, reaching first after being hit and taking second on a wild pitch. Coady then delivered a line drive base hit to bring Wilde around for the tying run with one out. 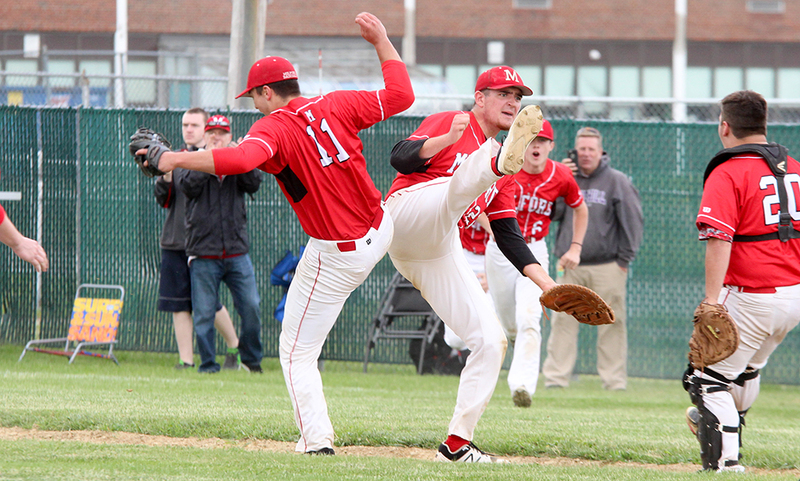 Milford baseball (12-9) advances to the D2 South Quarterfinals and will play at fifth-seeded Greater New Bedford (15-6) on Monday at 4:00. 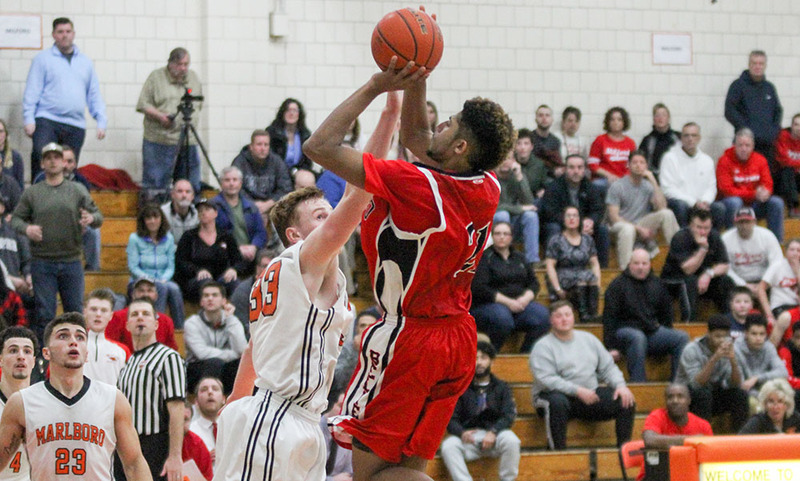 Stoughton finishes the season 15-6.